Back Details: Zipper-up Body Shape: All body shape Embellishment: Lace Hemline: Long Neckline: Jewel Season: Spring, Summer, Autumn Silhouette: Mermaid Sleeve Length: Short Sleeves Style: Elegant, Modest Waist: Nature Venues: Evening, Wedding, Prom, Party Fabric: Lace With its jewel neckline, formfitting bodice, short sleeves, zipper-up back, and long lace skirt, this ethereal long bridesmaid dress is worthy of celebration! With its unique see through shoulders, short sleeves and back, this long long mermaid dress brings you captivating elegance wherever you go! 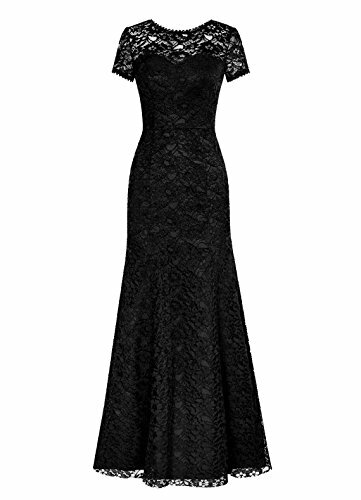 Wearing this elegant lace evening party dress is always a fashionable chance worth taking!